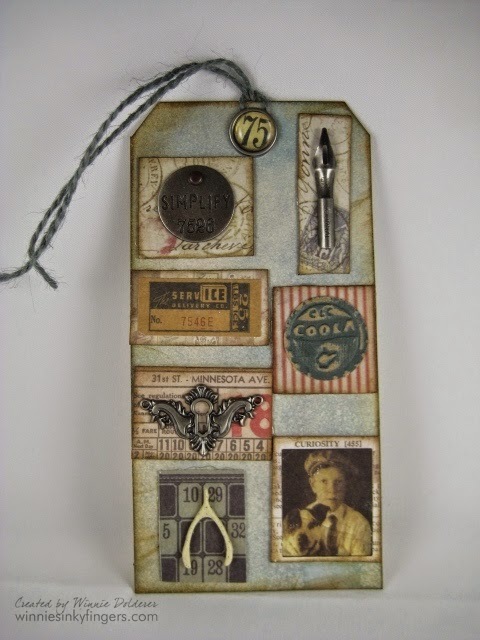 Today I am sharing the tag I made for the Tim Holtz monthly challenge for May 2014. Tim encouraged us take out our trinkets that we have in our stash and use them (what a novel thought!). It was a lot of fun digging through my collection of goodies to narrow down my choices. Believe it or not, that took me a long time in itself! This tag was fun as I got to use grungeboard, Distress Inks, an embossing folder and, of course, various ephemera. If you know me personally, you would know I have a Diet Pepsi habit (some say addiction ...), so I love Tim's bottle cap embossing folder. I used one cap that I sanded using his Core-dinations paper. I came across a fun piece of ephemera that said Serve ICE and knew I had to use it along with it. The composed look is something I normally never do, so this really gave me something new to try. I have some news to share with you today. I will be taking a couple of classes given by Tim soon! I cannot wait! I have been waiting a long time, and the countdown has begun! Okay, that is a lot of exclamation points, but that is only because I am truly excited. You truly achieved a vintage feel to your TH tag, and love that you incorporated a personal touch to it with the reference to Diet Pepsi. I'm also very excited for your marvelous opportunity to take classes with Tim Holtz himself. Therefore, I can certainly understand the extra exclamation points. LOL! Have a blessed week, my friend. Tea Time Tuesday - Strawberries, Anyone? Happy Mother's Day - You're The Best Mom! Congratulations On Your New Alarm Clock!